Living in a city like Paris has its advantages, especially in November and December when it transforms into a winter wonderland. Winter has officially arrived in our beautiful city and personally I can’t wait to enjoy it! The frosty weather has descended on us and in my current festive spirit, I have decided to write this blog to help all the people who are new to Paris find their way around the sparkly city this winter. Sadly this year a lot of the ice skating rinks I usually recommend are cancelled BUT there will be an ice rink at the foot of the Eiffel Tower this year from December 21st to January 8th. You’ll also be able to enjoy the Champs de Mars Christmas Village where hot chocolate and mulled wine will be on sale, as well as delicious winter dishes such as tartiflette. A skating rink not to be missed this year, especially as it is totally free! If you haven’t lived here for very long or you’re a tourist visiting the city you have most certainly been to Angelina’s. Their hot chocolate is delicious, I’m not disputing that fact, but us locals have found other places to enjoy this hot beverage and La Jacobine is one of them. Le Jacobine is a tiny cafe tucked away in the Passage des Arts. Their Aztec hot chocolate is by far the best I have ever tasted; it’s unbelievably smooth and not too rich. My advice: don’t eat before you go there and even though their cakes are delicious and very tempting (especially as they stare at you from the glass cupboard they are displayed in), don’t order one. You won’t need to eat anything, the chocolate will fill you up! Chez Papa is a chain of restaurants that serve whole-hearted and very filling French food. 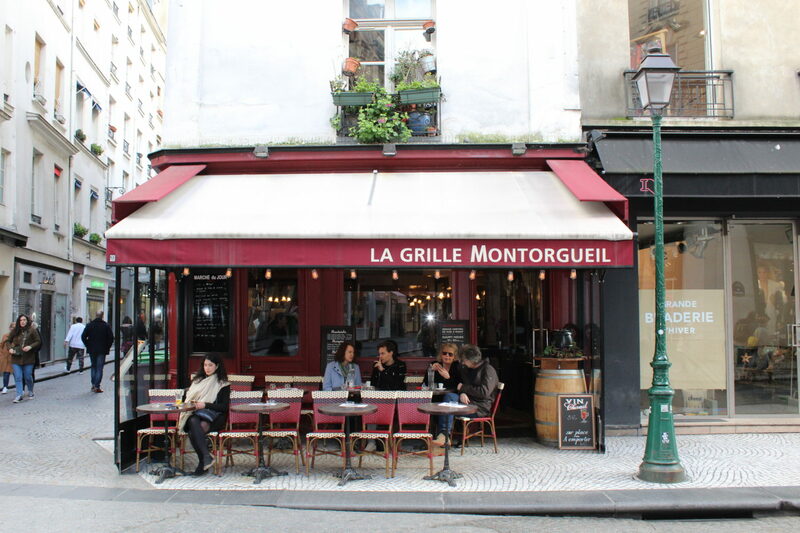 They are located all around Paris and are perfect for a meal on a cold night. Everything is delicious and everything comes on oversized plates or in oversized bowls accompanied with a pile of potatoes; it’s carb addict’s heaven. The staff are warm, welcoming and friendly so if you haven’t been there before I highly recommend trying it this winter. What I recommend: L’escalope de veau à la campagnarde (Veal escalope in a big pot covered in ham, cheese and mushrooms) and a glass of sangria or a good bottle of red! Okay, so this is slightly touristy but even the Parisians do it. From the end of November to the beginning of January Paris hosts a number of Christmas markets. The markets are based on traditional German markets so Gluhwein is available (a kind of mulled wine) as well as lots of traditional Christmas goodies from Alsace. Food and drink wise there are a large variety of choices: Gingerbread houses and christmas trees, cheese, charcuterie, churros, tartiflette and crepes are all available at the market. Shopping wise you can buy anything from scarves and hats to Russian dolls. The stalls sell jewellery, keepsakes, toys, and Christmas decorations so there is a huge amount of choice! The Champs Elysees is also lit up from top to bottom with Christmas lights which is, in my opinion, one of the prettiest things you will see all year. Click here for the full list of Christmas markets in Paris this year. 5. CHECK OUT the decorations at Galeries Lafayette and Printemps. While walking past Galeires Lafayette and Printemps the first thing you will see are the lights. The huge display of lights on the front of the stores are so eye-catching and so dazzling that you just have to stop and look. Every year the window themes have a different theme and the displays are often animated. For children and adults alike it’s a great experience. Last but not least, the Christmas tree inside Galeries Lafayette is also a must see. It’s also different every year and it’s always beautiful! It is totally free to see and one of the best things to see this Christmas in the city of lights. This year the tree is made entirely of balloons!! I’ll let you discover the tree yourself and won’t spoil the surprise with a photo! I hope this post helps you make the most of winter in this gorgeous city! I need to try all of these things, I think that because I’m French and and spend all my year in Paris, I’m used to the city but now I realized that I know nothing at all, except from the Galeries Lafayette/ Le Bon Marché, I didn’t even know it was possible to ice skate in front of the Hotel de Ville… Thank you for all the ideas ! Thank you for your message Anais! I’m so glad you enjoyed my blog! I hope you had time to try some of these things 🙂 have a good day! !